For those of you that haven’t cottoned on yet.. I do love a good challenge. Whether or not I manage to finish each challenge remains to be seen but I give it a go.. It’s the effort that counts right! 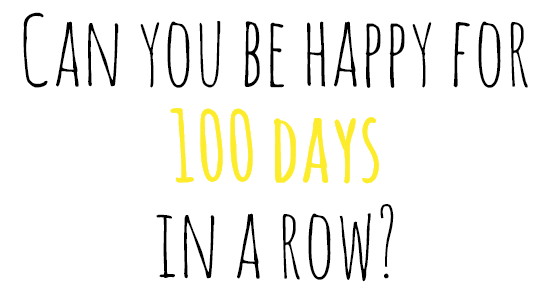 So when I came across the challenge ‘100 days of happiness’ I just new that I had to sign up! 71% of people tried to complete this challenge, but failed quoting lack of time as the main reason.These people simpy did not have time to be happy. Do you? The introduction to the challenge really hit home with me and made me think.. What does make me happy each day.. Well now I (and everyone that follows me on instagram) will find out what made me happy each and every day for the next 100 days! If you want to sign up for the challenge and share what makes you happy check out the 100 Happy Days Website! 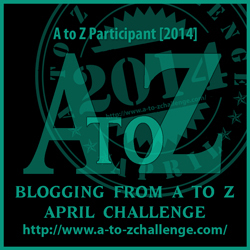 If you’ve never participated in a blog challenge then I definitely recommend the A-Z blog challenge! It’s super fun! You get to “meet” a ton of other bloggers during the month and it really inspires you to keep posting! Sign Up Here! To all of you who follow me, and to those I follow, from last year’s blog challenge I look forward to reading your entries this year! One more resolution for 2014.. So it’s official.. After having waited a whole 2 months since my last post I think it’s safe to say that my blog was pretty much abandoned. To all of who still reading this.. thanks for hanging in there. As I write this I’m looking at the date and thinking Where did January go? But then again saying that.. Where did 2013 go? So 31 days into 2014 I have decided to add one more resolution to the list, NOT abandon my blog! Hopefully this is one resolution that I’ll be able to stick to.. unlike my diet, exercise, stop smoking resolutions that have already been long since abandoned.. Happy belated New Year to you all! !